Data Science Foundation is a high level Data Science course designed with agenda covering all aspects of data science with core concepts. Data Science has three board domains viz., Statistics, Machine Learning/ Programming/ Data Skills, Business Domain Knowledge. The foundation courses focus on basic statistics, overview of Machine Learning with hands on practice with couple of ML algorithms and application of Data Science in top 5 industry domains. This also includes two hands-on Data Science case study, enabling the candidates to not only understand the core concepts but also gain practical hands on knowledge, thereby boosting the confidence to pursue further knowledge in the field of Data Science. Why this course - Certified Data Science Foundation? Data Science is becoming the most important element in any industry, any business. Most organisations, including forture 500 companies, already aligning their organisation structure to facilite the data science driven decision making at various levels.From the reports by main stream think tanks, top consulting companies, it is evident, beyond any doubts, that either an orgnasition or an individual professional, not gaining the Data Science skill will face uncertaining in near future. The Data Science Foundation course, provides you with solid foundation for Data Science knowledge. This course is equally valuable for beginners, professionals at various levels. If you don't want to left behind with this huge Data Science wave, this is the course for you. If you aspire to be a Data Sciencist, you will gain a clear road map to become one. Advantages of Data Science Foundation Course. Data science is the hot field that is booming up now. Be it a small company or an MNC, they need a Data scientist to manage their large pool of data. High demand for data scientists with only a few qualified people to hire, the companies are ready to offer extremely fat salaries to those who have completed this course. Who should do Data Science Course? This course is not specific for any industry as well as professsional experience. Any one from beginners to business leaders, aspiring to gain Data Science knowledge can pursue this course. Working professionals looking to change their domain to analytics/data science field. 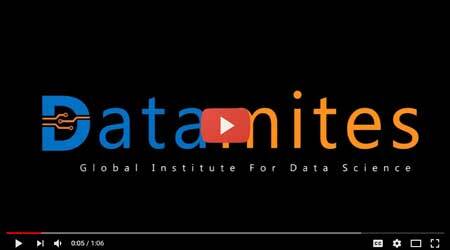 Any one, aspiring knowledge in the field of Data Science..
Why DataMites™ for Data Science course? DataMites™ is founded by Data Science/Analytics Experts, who had deep roots in the industry in USA and Europe for decades. You can choose from flexible learning options : Traditional classroom, Live Virtual classroom and Self learning. You can treat your DataMites™ relationship manager as your pal. We value your every request. 9) Data Science Career and Conclusion.